Medium tree, grey foilage, yellow rod shaped flowers September - October. 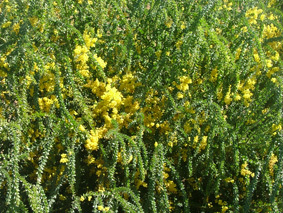 Large bushy shrub, grey-green foliage, yellow flowers. Small tree/large shrub, bipinnate foliage, yellow flowers. Weeping light green foliage, pale yellow flowers, most soils. 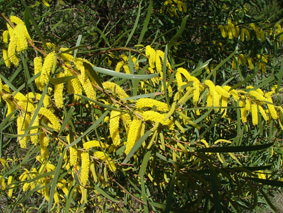 Small tree, blue-grey foliage, yellow flowers, most soils. Local species, fine bipinnate leaves, pale yellow flowers through out the year. Local species, grey-green foliage, golden yellow flowers. Local species, small open tree, dark green leaves, bright yellow flowers August - September. Small tree, narrow leaves, profuse yellow flowers in spring, most soils. Medium to small shrub, useful hedging plant, light yellow flowers in spring. 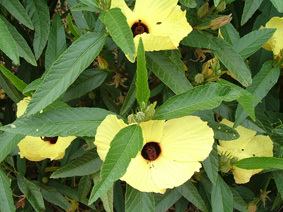 Straggling shrub, flat leaves, single yellow flowers. Local species, large shrub, dark green foliage, bright yellow flowers July - August. 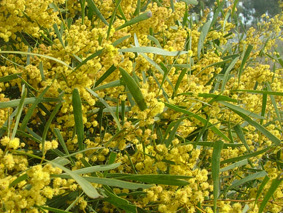 Large shrub, weeping blue-grey foliage, pale yellow flowers August - October, most soils. Small tree, large green leaves, bright yellow flowers, most soils. Open pendulous shrub, bright yellow flowers September - October. Local species, rounded shrub, yellow flowers. Local species, narrow pointed leaves, scented yellow flowers, most soils. Local species, weeping habit, silver-grey leaves, pale yellow flowers, most soils. Small tree, silver-grey foliage, golden yellow flowers, most soils. Small tree, arching branches, yellow flowers. Large shrub, golden yellow flowers. Local species, weeping green foliage, cream flowers, most soils. Multi-stemmed shrub, weeping habit, bright yellow flowers August - September..
Small pyramidal shaped shrub, white flowers, pink-mauve fruit, most soils. Dense bushy shrub, reddish new growth, white flowers spring. Compact shrub, bright rounded glossy green leaves, suitable for hedging and topiary. Erect shrub, yellow flowers summer-autumn. Large shrub-small tree, orange flower spikes summer-autumn. Upright shrub, yellow-green flower spikes summer-autumn. Large shrub-small tree, grey-green flower spikes autumn. Open shrub, pale yellow flowers summer-autumn. Small deciduous tree, white flowers. Erect shrub, weeping habit, grey green foliage, red flowers. 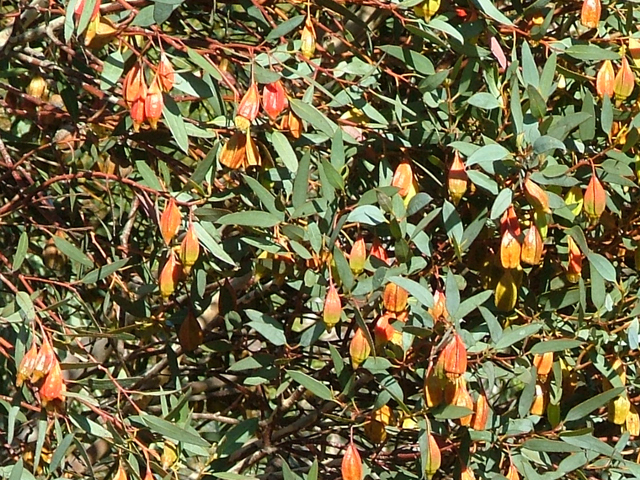 Weeping habit, light green foliage, red flowers. Medium shrub, profuse mauve flowers in spring. Attractive pendulous shrub with foliage to the ground, bright red flowers throughout the year. Local species, Needle-like leaves, red-orange flowers spring. Small tree, red flowers spring-autumn. 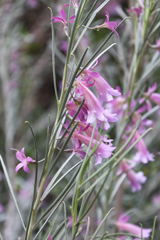 Medium shrub, grey-green foliage, pink flowers spring - summer, full sun or part shade. 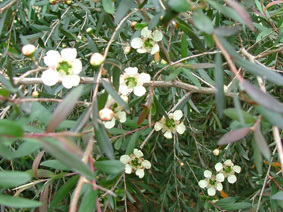 Upright medium shrub, green-grey foliage, pink flowers spring, full sun. Pendulous shrub, lemon flowers spring-summer. Small tree or large shrub, Attractive foilage with pink new growth, cream flowers during summer. Most soils. Weeping large shrub, bright red flowers summer-autumn. Erect open shrub, mauve-pink flowers spring. Slightly spreading shrub, pine-like leaves, red flowers spring-autumn. Local species, open spreading shrub, grey-green foliage. Large shrub, pendulous white tinged mauve flowers September - October. Spreading prostrate shrub, green foliage, yellow-green flowers spring-autumn. Erect open shrub, green foliage, white flowers most of the year. Full sun. Compact shrub, silver grey leaves, pale orange-light red flowers, spring-summer. Medium upright shrub, grey-green leaves, flowers very dark purple during spring - early summer. Large open shrub, grey leaves, lilac flowers spring. Large open shrub, grey leaves, white flowers spring. 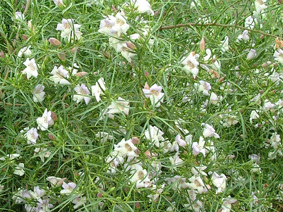 Upright shrub, grey green leaves, white-light pink flowers September - November. Large shrub-small tree, green leaves, masses of white flowers spring. Medium spreading shrub, fine narrow green leaves, blue flowers, spring. Medium compact shrub, narrow sticky leaves, lilac-light blue flowers August - October. Small compact tree, orange flowers December - January. Small compact tree, red flowers. 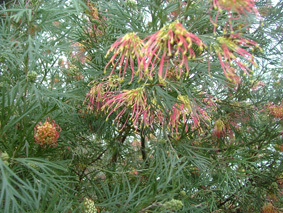 Medium bushy tree, orange flowers December - January, most soils. 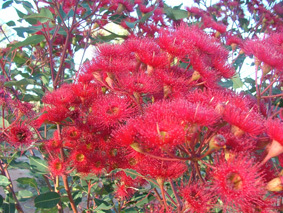 Medium bushy tree, prolific brilliant red flowers December - January, most soils. Small bushy mallee, ornamental grey-white juvenile foliage, small white flowers, suitable most soils. Small tree, silver-blue leaves, white flowers, most soils with good drainage. Small slender tree, dark green leaves, white flowers spring. Small tree, smooth white bark, leaves dark green, red-pink flowers late summer - autumn, most soils. Bushy small tree, ornamental for its bell shaped red four-ribbed fruits, most soils. 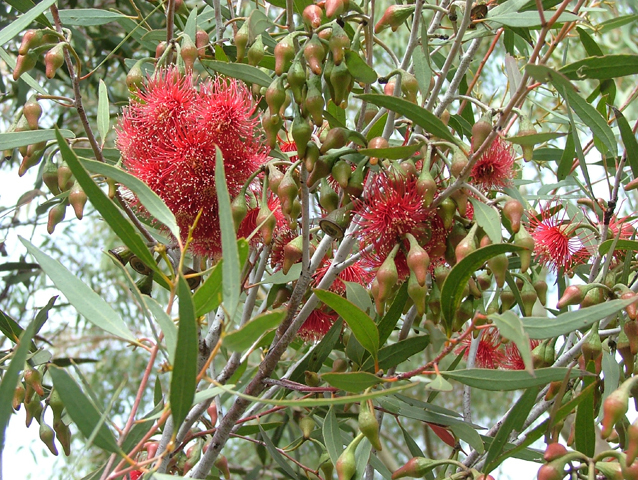 Small tree, red-crimson flowers in spring, well drained soils. Small dense mallee, ornamental juvenile grey foliage, flowers cream-white. 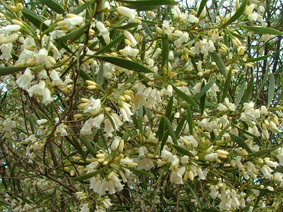 Small tree with a dense bushy crown, dark green leaves, pale yellow white flowers spring. Ornamental small shrub, large oblong leaves, large bright yellow flowers in spring. 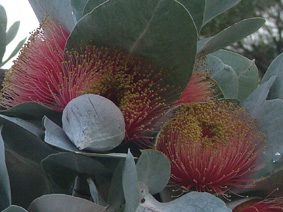 Open upright mallee, silver-grey rounded leaves and stems, large red flowers in autumn - spring, most well drained soils. 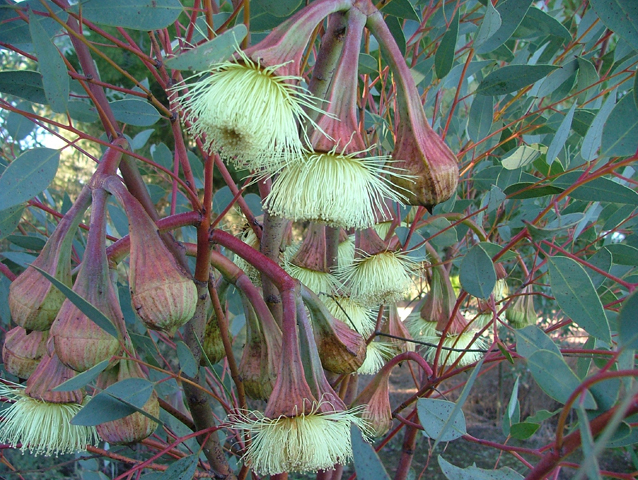 Small mallee, narrow dark green leaves, smooth bark, flowers cream, pink, or red. Small to medium tree, smooth white bark marked with insect scribbles, grey-geen leaves, white flowers spring-summer. Unsual tree, slender trunk with drooping branches, smooth white bark, narrow olive green leaves, cream - pale yellow flowers summer. Local species, small mallee, grey-green leaves, pale lemon flowers winter - spring. Small tree, dense foliage, blue-grey leaves, freash yellow-green bark, pale lemon flowers autumn-winter. Rounded spreading shrub, fiery red flowers during spring. 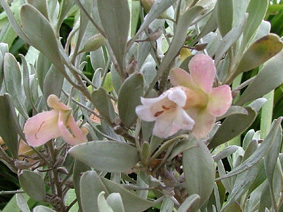 Medium shrub, greyish leaves, pale pink flowers above foliage. Medium shrub, creamy white flowers. Upright large shrub, mauve - pink flowers September - December. Medium to large shrub, fine open foliage, lemon brush flowers, mainly spring-autumn. 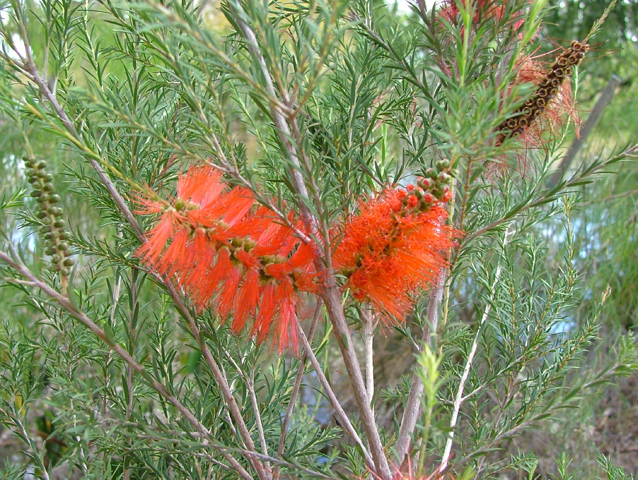 Large shrub, dark green leaves, orange spider flowers, throughout the year. Tall open shrub, grey foliage, orange-yellow flowers spring-early summer. Medium erect shrub, pink creamy flowers summer. Large open shrub, grey-green toothed leaves, pink flowers spring. Erect shrub, pink flowers spring. Large shrub, red-orange flowers winter-summer. Screen plant. Erect shrub, pink terminal flowers. Erect shrub, showy pink flowers winter-spring. Dense medium erect shrub, showy pink flowers winter-spring. Tall erect shrub, showy pink-red flowers June -August. 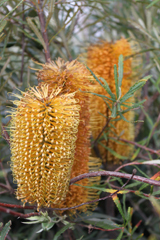 Medium erect shrub, noted for its orange-yellow-cream-green foliage with age, good drainage. 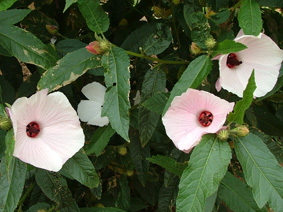 Open shrub, grey-green leaves, large pink flowers spring-autumn. Small narrow tree, shiny green leaves, fragrant cream-yellow flowers, ample moisture. Rounded shrub, copper-light brown foliage, white flowers late spring - early summer.. Tall shrub, pendulous grey foliage, white flowers spring-summer. Large rounded shrub, bronze-green leaves, white flowers spring - early summer. Medium shrub, dark mauve-purple foliage, white flowers spring - summer, full sun. Open shrub, lemon scented leaves, white flowers spring-summer. 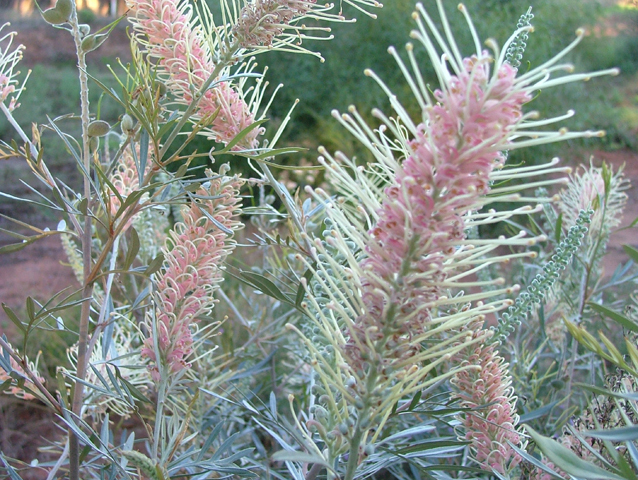 Rounded spreading shrub, linear leaves, white bottlebrush flowers spring-summer. 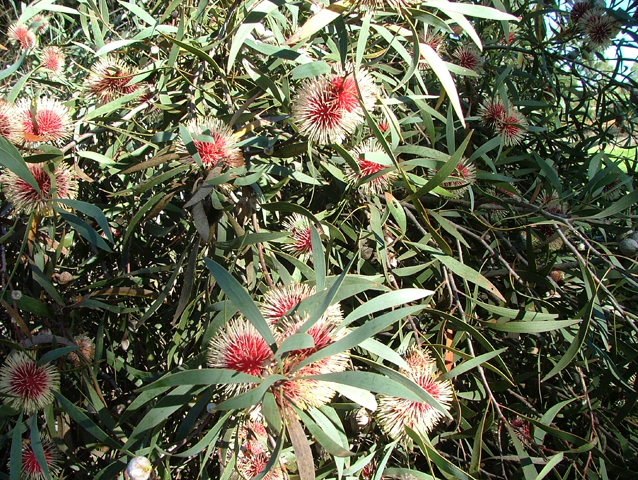 Rounded spreading shrub, linear leaves, pink bottlebrush flowers spring-summer. Large shrub, profuse white flowers, spring. Twiggy shrub, blue-green leaves, crimson flowers with golden anthers, spring. Medium shrub, weeping grey foliage, white-yellow flowers spring. Medium open shrub, vivid orange-red flowers, late summer - autumn. Medium open shrub, profuse light yellow terminal flowers, spring. Large dense shrub, violet flowers, late spring-summer. Dwarf form, mauve flowers late spring - summer. 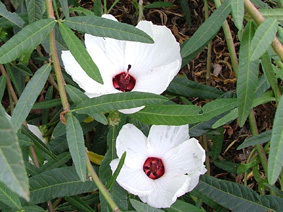 Erect shrub with terminal white flower in spring followed by reddened calyces in summer. Medium shrub, large red terminal flowers September - October, full sun to part shade, good drainage.